In order to learn more about my beloved hobby, I have been thinking for a while to study some horticulture. It has been a bit difficult to select colleges: from an horticultural outsider's perspective they looked all more or less the same, nothing validated one over the other, and prices varied - sometimes considerably. Luckily I got some expert advice from Garden Organic - I have to thank Sally for her very sweet email and really sound suggestions! Out of a list of three colleges, my final choice went to the Horticultural Correspondence College. I have just signed up: wish me luck! BTW, I have noticed with great pleasure that there are a few ladybirds at my allotment - and they are mostly native 7-spot as you can see (picture taken on Sunday morning)! Only one Harlequin to be seen. I wish I could say I spent the whole of my weekend - in splendid weather - at the allotment. However, that would be too good, wouldn't it? 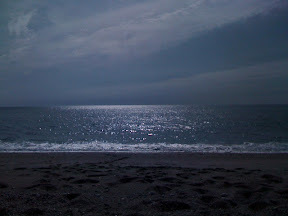 In fact, despite the fantastic weather I spent most if the two days indoor. The two hours I've been on the plot, though, have given much satisfaction. I have to make an apology - the allotment manager got back to me in the end saying that manure was "organic". I was tempted to go with that, but I decided to leave it for this year and see how I fare on green manure and my own compost. Since it will take me a while to put together my recycled pallet compost heap, I have bought one of those plastic bins to use in the meantime. And I stocked up in organic seeds. Talking of which, I noticed there are plenty you can start off at this time of the year, so I am getting organised with more shelf space in the greenhouse. That will hopefully keep out the thugs this winter as a desirable side effect. In the meantime I planted a booster collection of brassicas, which I hope will do well under beautifully supported netting protection and with a sprinkling of slug pellets here and there). And transplanted the leek seedlings, which are - however - frightfully behind (if you have a magnifying glass you might see them just beyond the brassica bed, tiny green threads timidly emerging from wet soil). In terms of crops, tomatoes San Marzano have been unexpectedly prolific, considering the little care, and they did ripen, so tonight I will have a delicious Caprese. Besides the all-year-round self-seeded spinach beet, still cropping though in decline are: courgettes, beans, raspberries. Sweetcorn is almost ready, but I am not sure about the hundreds of celery plants that look too small, but had not time to examine closely. And in theory there's still a bed of potatoes to dig out. Won't get bored any time soon. Talking to Neil at Bangors, who is amazingly motivated as an organic producer, has made me reflect on my own beliefs and motivation. So far, I have grown with organic methods, but not fussed too much about organic seeds. I have avoided any seeds which were treated with fungicide, and specifically bought organic seeds for those crops that are more at risk of GM: corn & soya (potatoes may be soon). ... and from a personal choice point of view I do not like at all that GM may well slip into my food without my knowledge (maybe it's because I am Italian and with food I have a special relationship). Anyway, this is all very good in theory, but in practice it is quite difficult to live by the principles. In my allotment, for example, I have no control on chemicals or other contaminating materials that may be used by my neighbours. At Riverford Farm they explained that you have to put some barrier between organic & non-organic fields, in terms of some metre's space and 'filter' hedges. Another example - this is manure time. 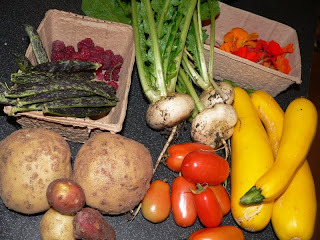 I have enquired with the allotment manager if we know of its quality: do they use GM food, chemicals or antibiotics at the farm it comes from? I think she simply ignored my email, and I can see why: why bother checking? Not very many care. But the thought of Neil and his work is nagging at my conscience, so I decided I will do without manure, making the most of the green one and will count on my compost-heap-to-be for the rest. I want to steer clear of "fundamentalism" in any shape or form, but I think the way we live is hardly sustainable and often unhealthy: serious gardening, being so connected to nature & the seasons, brings it home strongly. So I will try and do a bit more this year: my crops may not end up organic anyway for external causes, but I want to support the effort made - often by small producers - to be more sustainable. Do you see how beautiful my three first-ever rapa bianca lodigiana specimen are? I have tried to grow that turnip for more than a year, and now it has come out (possibly because the weeds competed for attention of the slugs...) ... and the first ever ripe, red tomatoes? Grown in the open, not in the greenhouse! Beans are still climbing profusely, surely as it has been very dry, and the potatoes you see are a representation of the 14kg I picked before going on holiday (there's more scattered around). Rasperries are also cropping: there seems to be a second round of yellows on their way! 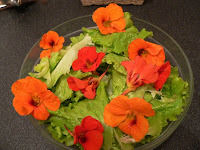 And I finally got around picking the nasturtiums... fancy a look at the salad I made with them ? - in case you were wondering ,the salad leaves are not mine, I did not manage to grow any this summer, but I could have a go with winter lettuce. I have been on holiday last week, but my allotment was never far away from my mind. We spent a few day in Bangors Organic B&B, where I learnt how to identify potato blight, and that the scab on my potatoes is innocuous. Also, I tasted for the first time nasturtium (despite having grown it I did not pick it): both the flowers and the seedpods are very peppery, and Gill who cooks the produce of the farm deliciously uses them as capers. Lying on a sunny Cornish beach was perfect to get finally round reading my book on preserving produce: you have to beware of 4 enemies! Enzymes break down the vegetable matter, starting as soon as it is picked. They are killed by heat and slowed down by cold, hence freezing. Fungi have their spores in the air, hence covering food. Bacteria (some of which may develop toxines, and who do not like either acidity or sweetness) and yeasts live on things, and the latter cause fermentation. Excellent book, easy to read and practical, with methods and recipes! I am now sure I have done something wrong with my jam - which came out very runny - although I am not sure if it was for either too little or too much sugar. In a while it will be again that time of the year for reflection on the growing seasons, followed by planning, and I am sure all this new information will make my third year as an allotment holder even more rewarding, as I gradually develop an understanding of the bigger picture: Certainly I have learnt a lot in the last 24 months. Back, I am! - Today, halfway through writing my last uni essay, I decided I had enough and wanted to go to the allotment, which I did, for three hours. This is how it looked when I arrived, and a lot of excitement in store! It took me a while to get my head round where to start, especially as one of my gloves was gone: vandals have been coming in I know - but what's the point of stealing one spare glove? Anyway, after loading the rat trap (I saw something moving behind the shed), I mucked about my compost-heap-to-be, wondering whether to burn the dry remains of all the vegetable matter I left uncovered, and decided there were too many spiders and ladybirds in it, that was not worth disturbing. Then I moved on to the potatoes, as this is manure time, and you need space at the bottom of the allotment for the truck to unload it: potatoes were in the way so I decided to clear the bed. the healthy but tiny ones, less than 1cm, to plant again next year. I must say I was feeling uneasy - not only because the vandals might come back and I was alone on the grounds, but also for a general feeling of squeamishness. To set the scene for what happened next, I have to tell you that a few days ago we had the roof man for a quote, and he mentioned that the lead used on roofs makes them unsuitable for water collection for vegetable watering, as there is a risk of poisoning. That set me thinking about all the risks & unhealthiness possibly hidden in the ground - an irrational fear, but still too fresh in my mind. As I went on weeding behind the potato bed, while pulling some bindweed, I heard squeaking coming from underneath. What would you do if you heard squeaking from a hidden place in the middle of your vegetables? I panicked. Shaken, afraid of mother bites and even more of rats proliferation, I picked the five little creatures and threw them away. Not a good feeling throwing away live things - especially as they look kind of cute even though they might be pests. But I really did not know what to: surely the mother would not want them after my picking them up; for a split second I though I might feed them and see what they came out to be exactly - mice or rats. Very soon afterwards I started thinking they might have been hedgehogs or other useful creatures, so I panicked even more. I am stil a bit upset now, even after some research at home confirmed they must have been either mice or rats; actually very small: one to three days old, with grey hair coming out - hedgehogs would have bristles already. Mice they may be but there's people keeping them as pets... what should I do next time that anything like this happens? What should I know? How do I identify creatures? What are the risks they might pose and any benefits? However, even with all the excitement and moral reasoning, the plot looked much improved after I left, just before dusk - my hands trembling a little as I picked a couple of courgettes and some raspberries - I'm back! Anyone knows what this white wiggly worm is? Good or bad? I am finding them all over the place at home: looked as if they were coming from the green bin and have been quickly invading the pots. The creature - less than 1 cm in lenght - is a very fast mover, seems to come out just before dusk, takes its own life in droves by drowning in any bucket or saucer that has water in it, seems to live just under the surface of the compost. Plants do not look damaged so far. The worm does not have a head, but moves thin side forward, (there's a black thread in the middle). The other side looks chopped, with some spikes. Been squeezing as many as I can as a precautionary measure, but really have no idea what they are: are they ok or by taking pots to the allotment will I be incidentally starting an epidemic? Since I had such a rewarding crop tonight (despite the little effort I put on the allotment in the last few weeks), I decided to use the veg as fresh as possible and mixed most of them together in a last-of-summer pasta (you can recognise courgettes and flower, tomatoes green and red, beans - saved the cucumber though and, now I think of it, I should have used some onion for that deliciously mellowing texture, anyway...): here you go! P.S. The one fig that looked a bit overripe was actually de-li-cious! So beautiful and decadent and so horrible at the same time: it will take a lot of work to clean it back and the days are shortening quickly, so it will have to be a weekend job. Rewarding crop, but still a full week of uni to go... so I had better go home now.